The Color Palette has never been out of Fashion, especially if it has been used to express oneself. Be it the subtle flaunt of Royalty with Purple or a daunting display of Passion and Power with Red, the relaxing soothe of Peace with Blue or just a Happy Pink! And then… the world gets better when you get to Wear the color of your Dreams! The concept of ‘Dégradé de Couleur’ which means ‘Gradient Colors’ in French drives our exquisite gallery of fine art. Art, culture and color have all come together to inspire this new collection ‘Gradient’, where hues of coloured gemstones dictate the movement of eye. 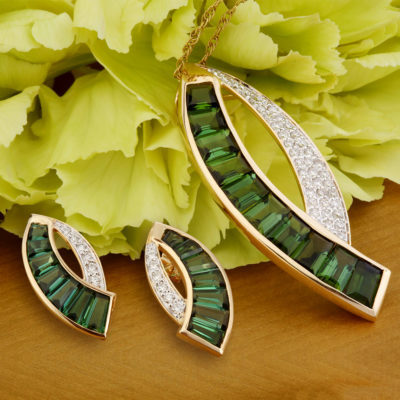 Hand picked selection of lustrous gemstones are set individually or in combinations moving from dark to light, complimented by pave set diamonds. 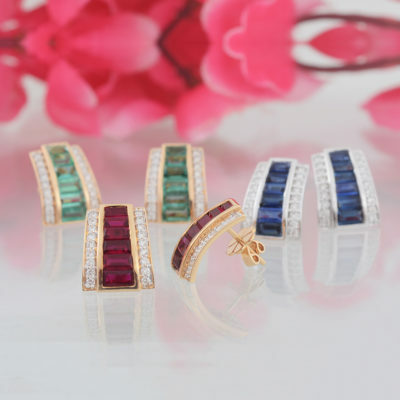 Express your love and passion, feel the subtle sooth and conquer the calm confidence with these Ruby, Emerald and Sapphire Studs complimented by array of diamonds. 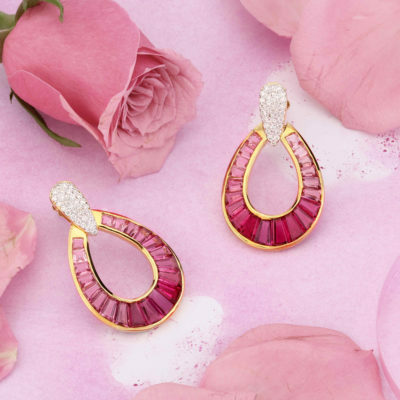 Express your love and passion with these deep red ruby studs set in Yellow Gold… The dominance of the red colour is extremely intoxicating which is subdued by the complimenting array of diamonds. 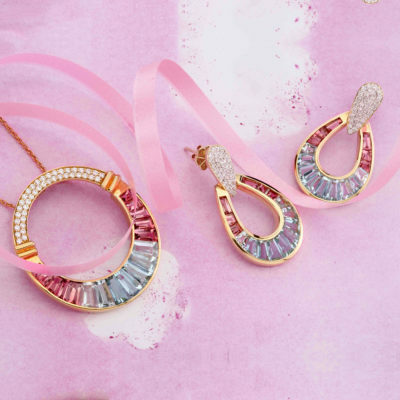 Get yourself summer ready with these delicate drop earrings with a matching circular pendant, studded with diamonds and Pastel Pink Tourmaline and Aquamarine combination. 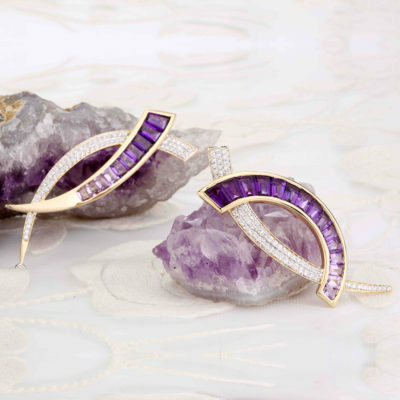 A timeless and impeccable piece of art, the aesthetics of this Royal Amethyst Pendant takes care of the changing tastes and trends of modern world yet retaining its original classic form. Gradient Collection is an inclusive collection giving you the freedom to experiment with the various combination of colors. 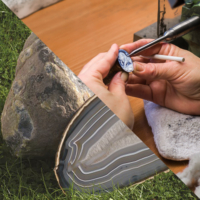 Our Colorstone Palette has an interesting and exhaustive collection, covering both Precious Gemstones like Ruby, Emerald & Sapphire; & Semi Precious Stones namely Green & Pink Tourmaline, Tsavorite, Peridot, Amethyst, Citrine, Aquamarine, Garnet, Blue & Yellow Topaz. Each stone is handpicked carefully keeping in mind the lustre, color, clarity and is then taper cut to perfectly fit the baguette according to the shape. 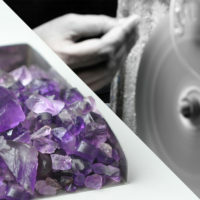 There is absolute precision in cuts to enhance the fire of each stone and to achieve maximum brilliance. Such is the effect, that the colors of the collection commands the eyes of the beholder – Our connoisseurs in the industry would agree! An approach towards an impeccable craftsmanship, the quality of our products is at par with the International Standards. The collection radiates the essence of elegance and the balance as the level of detailing in each product is taken care of at every step of the manufacturing process. 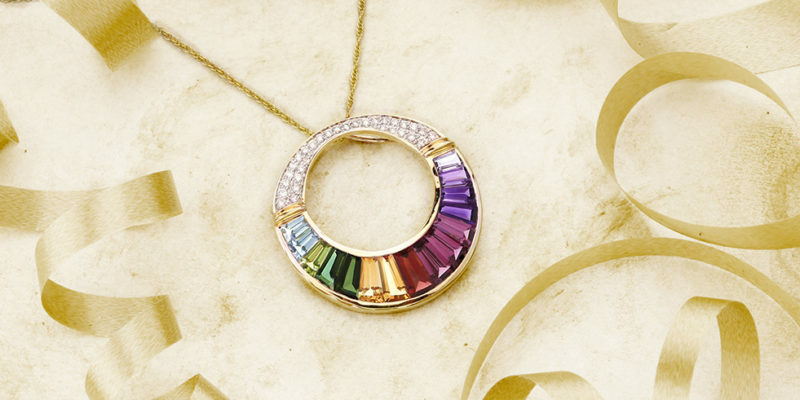 So come, choose the color of #YOU and wear it with poise!